To be honest this is the Clash Royale Private Server 2019, which is in the list of best servers. Mythical Cell 2019 Apk brings some of the best fun moments for the Clashians. 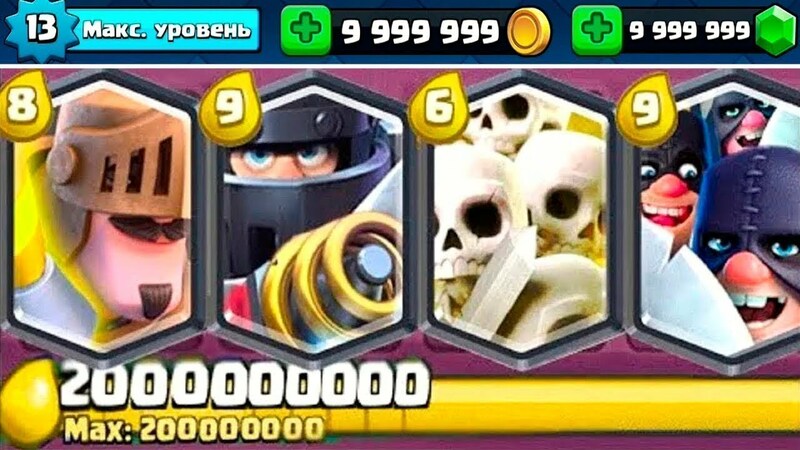 Everyone who is looking for Unlimited Coins, Unlimited Gems, Instant Chest Unlocks, Custom cards, Custom Legendary troops etc, He/she should immediately get his/her hands on this Mythical Cell Apk for the Android or iOS devices. Although there were many Clash of Clans private servers on the top charts last year. But due to the clean sweeping move by the SuperCell admins to remove most of the top notch private servers on the bases of Copyright issues, made us choose from limited working CR private servers in 2019. The Mythical Cell Private Server has all the best features so far of any Clash Royale fan who wants to be in the spotlight. So for Any one of you who wanted to experience the game in full throttle must get this Mythical Cell downloaded on his phone. The Official Mythical Cell private server comes with custom cards and magical stuff. Moreover you can get the new Giant Ice Golem which knocks off opponents tower with heavy punches and then freeze the whole area with extra high Death damage. Similarly the mortar in Mythical Cell 2019 is upgraded with the range going out of town. It can hit opponents King’s tower even if it is placed beside your King Tower. Moreover the Minion Horde are also doubled in number as this custom card is the most deadly I found in this server. There are tons of Unlimited Coins, Gems and elixir in this latest Mythical Cell 2019 version of the server. Beside this you have the custom cards in it too. 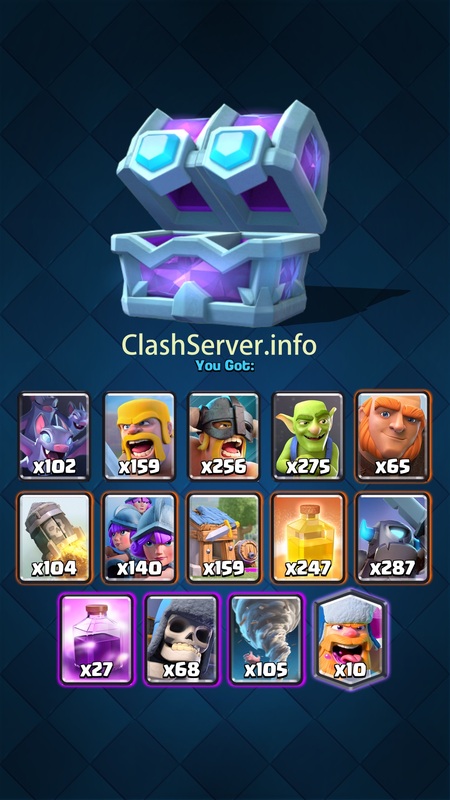 There are numbers of Legendary Chests followed by Legendary King’s chest at the start of the game. So if you want a fresh new Legendary card to start off your campaign. Just get your taps on the first available free Legendary Chest that will be offered in the game. Here are some more chests. The updated version of Clash Royale v2.5.0 Apk (The December 2018 Update) is already out there. The Mythical Cell teams seems to be ready to announced the Clash Royale 2.5.0 Private Server Soon. So stick with us and we will update all the links whenever this private server is live for the users. Now is the time to take this Clash Royale 2019 Private Server on to your Android devices. Just click the link below and get the files downloaded. Although this server has not been updated to the latest CR 2.5.0 version. But it’s still fun to play the game on this server. Some of the users have expressed issues with the 50% loading screen stuck. This is due to the non-responsive server. But Mythical Cell seems to tackle this issue. Now you can get through this Loading screen stuck issue and play the game. I have tried and tested this latest Mythical Cell Apk. So in the conclusion I can assure you that this is the best available Clash Royale Private Server 2019. You can get it downloaded easily. Also if you want to check out more private servers. Then don’t forget to pay a visit to ClashServr.Info. Right Now! 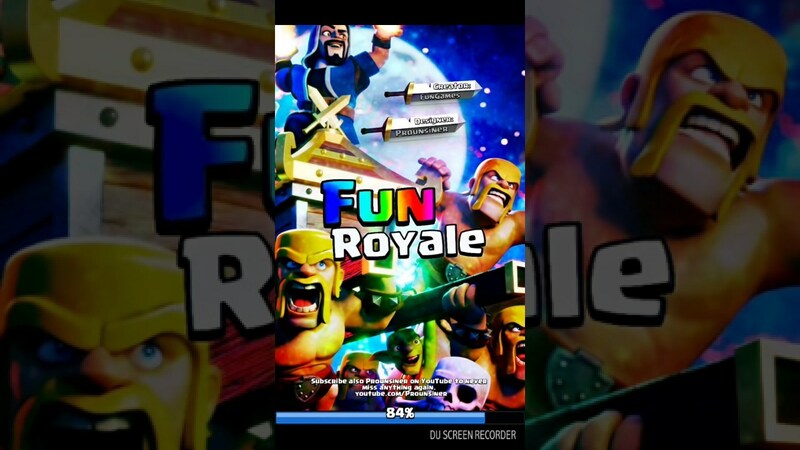 Download Fun Royale APK 2019 – Latest Clash Royale Private Server. The latest and updated Clash Royale Private Server, Fun Royale Apk 2019 is here. The developers behind this custom server are the folks who made Clash of Lights Private Server for the COC game. This Fun Royale private server is loaded with custom new cards, New Chests and bundles of Coins and Gems. The best thing about this private server is the abundance of Chests at the start of the game. Which gives any player a boosted start. This helps in unlocking all Common cards, Rare Cards, Epic Cards and the Legendary Cards in the game. The quick up-gradation of cards helps in increasing the King Tower level to Max 13 in no time. Below are some of the main features of the game. 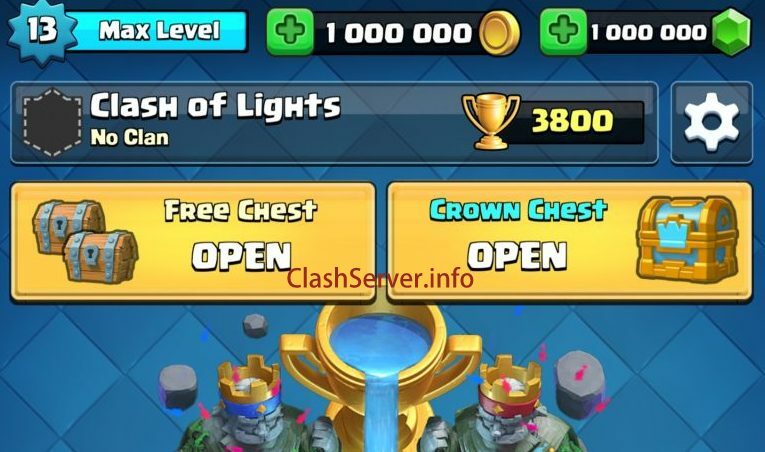 The Clash Royale Private Server 2019, The Fun Royale comes with many new feature, just like Unlimited Coins, Unlimited Gems, easy and quick chest opening in the game. The double cards chests are also fully functional in this modded version of the game. The main features include the following options. Beside this, there are as many custom cards built in the modified version of the game. The FunRoyale 2019 is packed with all the updated card version. New Heroes added in custom card section. 12+ Custom made cards with unique features. To download the Clash Royale Private Server 2019, The Fun Royale. All you have to do is get the updated version of the FunRoyale v2.4.3 Apk file from the link below. All other Clash Royale OBB or DATA files for the Private servers aren’t true and no need to download them from different servers. Connection Error: Unable to connect with the server. Check your internet Connection and Try again. Now we know that it’s not your Network problem, but the developers lazy servers behind this network connection error issue. All you have to do is try and try again in different times. You would eventually pass through this barrier. I have tried and tested this Fun Royale 2019 Clash Royale Private server Apk on my OnePlus 6. And I will not hesitate to admit that cheating with the games rules makes CR even more fun to play. The new custom characters and PVP gameplay vs real players makes Fun Royale Private Server 2019 for Android even more fun. If you are still not satisfied with this modded version of Clash Royale 2019, Then you can check ClashServer.info homepage. We have plenty of stuff for you over there. Clash of Clans for PC Windows 10/8/7 Laptop and Desktop 2019 for Free. Latest Clash of Clans Hack 2019 [Updated]- Unlimited Gems, Coins, Elixir. How to get free Legendary Chest in Clash Royale. How to Install Private Servers Apk files on Android devices. ToxicLand APK COC Private Server 2019. Clash of Dreams | COC Private Server for Android and iOS 2019. Disclaimer: This content is not affiliated with, endorsed, sponsored, or specifically approved by Supercell and Supercell is not responsible for it.